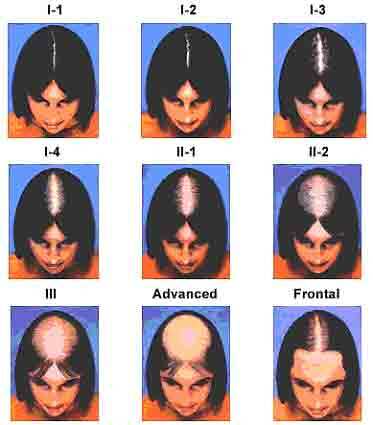 Female hair loss occurs in more than one pattern. In most cases, female hair loss can be effectively treated though the patterns of hair loss in women are not as easily recognizable as those in men. Unlike hair loss in men, female hair loss may commonly begin at any age, may not have any obvious hereditary association, and may not occur in a recognizable “female-pattern alopecia” of diffuse thinning over the top of the scalp. A woman who notices the beginning of hair loss may not be sure if the loss is going to be temporary or permanent. Women tend to have less obvious patterns of hair loss than men and non-pattern types of hair loss are more frequent in women than in men. The female pattern loss is classified according to the Ludwig Scale.